The new DC Universe is a month old now, and in an extra-sized episode Blake, Erin, and Mark sit down to talk about how that first month shaped up. Mark gives us the retailer’s perspective on how sales have changed not just for the New 52, but for other titles as well, and the gang discusses the hits and misses of the last two weeks of titles. In the picks, Erin is just getting into the Dresden Files, Mark is a fan of Annihilators: Earthfall and Herc, and Blake cheers the premieres of Ghostbusters and Dorothy and the Wizard in Oz. Contact us with comments, suggestions, or anything else at Showcase@CXPulp.com! With tax season upon us, we’re all going to look for less expensive entertainment. In the interests of helping us all with that dilemma, I’ve taken it upon myself to sift through Amazon for a few graphic novels that — at least as I write this — can be had for under ten bucks a pop. Smart comic fans, I think, should fall somewhere in-between these two extremes. Nobody should ever read any comic they don’t like (save your money and buy something good), but it’s even more important not to close yourself off to a great story just because of the genre it is written in. Just as comic book fans have divided themselves into these camps, however, superhero comics to a very large degree have divided themselves as well, and although there are some exceptions, almost all mainstream superhero titles these days play more to one side of the spectrum or the other — they deconstruct the heroes, or they glorify them. “Deconstruction,” of course, is nothing new — one could argue that it goes back as far as Green Arrow’s discovery of his sidekick Speedy’s heroin addiction. There are lots of kinds of deconstructive stories — those that show the heroes has having all-too-human flaws or feet of clay, or those that simply show them failing, or achieving victory but at too high a price. The darker threats, the mass murders, the terrorist actions. These are the “deconstructive” comics. Pretty much every title under the Marvel Knights banner fits this description — Daredevil is a great example. He was, in his early days, a brighter character, akin to Spider-Man, but as time went on he got darker and darker. Now his comic is the epitome of gritty, showing hard crime and real consequences. Matt Murdock’s world is not a nice place to live. Brian Michael Bendis, of course, is one of the tops in this realm of comics — along with guys like Grant Morrison and Bruce Jones, and perennial favorites like Frank Miller and Neal Adams. These are often the only comics the “too cool for school” crowd will touch, mainly because it’s so “grim” and “edgy” and helps to shatter the ideals of the spandex-clad warriors they sneer at the rest of the time. Then we have the flip side of superhero comics — those that take the traditions and standards of the genre and raise them up, glorify them, and make them seem fresh and new again. Take a look at Mark Waid’s Fantastic Four for a primary example of this. While the “Unthinkable” and “Authoritative Action” storylines he told last year did get pretty dark, he stayed with what made the characters the heroes they were rather than pull them down, and he closed off that chapter of their lives in the “Afterlife” story by bringing back the Thing (killed in “Authoritative Action,”) with a little help from a certain Man Upstairs who looked an awful lot like Jack Kirby. Some readers balked at the unabashed sentimentality. I thought it was brilliant. Geoff Johns has also proven himself quite adept at the glorification of superheroes, and he does it in a way that Waid often does too — he mines their pasts, digging into classic stories from the golden, silver and bronze ages, and uses them to craft something totally new. A lot of his Teen Titans series up to this point has been about bringing together threads left by the classic Marv Wolfman/George Perez incarnation of the property, but updating it to fit in the new members of the team. In Flash, he keeps taking old villains and remaking them into more serious threats (as he did with the likes of Mirror Master and Captain Cold) or introducing new threats that tie into the past of the character (like Murmur and the new Zoom). Johns may just save his best storyweaving skills for JSA, however, and it’s no wonder. This is the first superhero team in the history of comic books, and several of the oldest characters in industry are still members. What’s more, they have progeny and proteges that are carring on in their names. Johns has brought together the legacies of the Star-Spangled Kid and Starman stogether in Stargirl, restored Hawkman to a characterization that actually makes sense and even made a character with the goofy Golden Age moniker Mr. Teriffic a deep, interesting character. But man, the stuff he’s done with Hourman is even better. The original Hourman, Rex Tyler, died fighting Extant during DC’s Zero Hour miniseries. There are two other Hourmen walking around, though, Rex’s son Rick, and an android from the future with time-travel powers. In JSA we learn that the android plucked Rex from the timestream just before his death and gave him one hour to spend with his son, who could break up that hour into increments anytime he needed to talk to his father. When Rick was almost killed fighting Black Adam, though, he and Rex switched places, with Rex back in the “regular” timestream and Rick trapped in time. Johns wrapped up that storyline in last week’s JSA #66 with an ending that showed off everything that made these characters heroes. If we’re talking about glorifying superheroes, though, one need look no further than Astro City. Kurt Busiek, Brent Anderson and Alex Ross have created a real lush, wonderful world that pays a brilliant tribute to everything that superhero comics have to offer, and they look at it from every angle. If you haven’t read this comic, you haven’t read superheroes right. Here’s the thing — while excellent stories have been told in both the deconstruction and glorification subgenres of superheroes, not all characters are suited for both. Superman and Captain America, for instance, never really work in deconstructed stories. When you start making Superman grim or edgy, you lose what it is that makes him Superman. This was the big problem I had with Mark Millar’s Ultimates series, and the reason I’m not getting Ultimates 2. Millar recreated regular Marvel characters and made it a point that they were not the same as the ones we were used to. However, the new characters he whipped up seemed to me to be nothing more than the original character’s worst traits magnified to the extreme. Giant-Man was nothing more than a wife-beater. Iron Man was nothing more than a drunken philanderer. Captain America was nothing more than an arrogant nationalist. On the other hand, characters like the Punisher just don’t hold up if you try to glorify them. Even when you go lighthearted, as Garth Ennis did in the Marvel Knights incarnation of the character, it has to be dark humor, with an undertone of madness that belies the character’s situation in life. Then there are those rare characters that work if you’re deconstructing or glorifying superheroes. I think the X-Men are probably the best example of this. During New X-Men, writer Grant Morrison dissected these characters, brought their faults to the forefront and made them face down threats — both from without and within — that tore the team apart. Much of his story was a satire of some of the more ridiculous aspects of the characters (Magneto’s tendency to get resurrected no matter what the circumstances of his death were, for instance, or the egocentric notion that the “X” in Weapon X was a letter and not a Roman numeral). He took the X-Men apart and pieced them into something new, then he put the chairs on the tables, wiped down the counter and left. Then he leaves and what happens? Joss Whedon comes in with Astonishing X-Men and, using many of the same characters, puts them back into costumes and sends ‘em out to be superheroes. And it works, just as well. Meanwhile, Nunzio DeFillips and Christina Weir remake their New Mutants series into New X-Men: Academy X, a book about — what else? — teen superheroes. These are kids learning to one day become X-Men, and as such, the book has several elements that both glorify superheroes (the code names, the “squads”) and break them down (how Wither accidentally killed his father with his powers, for instance). There are many, many different things that can be done with superhero comics, and a great many of them are being done right now, done very well. There’s an old saying in some parts of the country that if you don’t like the weather, wait five minutes and it will change. With comic books, if you don’t like one, just take a step or two further down the rack. Even if you’re looking at a rack of superheroes, you won’t have far to go to find something totally different. Welcome back, Bill Willingham, you have been too long absent from this list, but last week’s Fables #30 bolted you right back to the front of the pack. I’ve been a fan of this title since the first issue, friends, and issue #30 is possibly the best yet. This is the answer to “decompressed” storytelling here, everything happens at once. The Fables are reconstructing their home after a battle, the election for the mayor of Fabletown is going off, Snow White is in labor (and Bigby Wolf is the father) — there are three major storylines in this issue, a half-dozen (if not more) minor storylines, and there’s still room in there for a few surprises. If you haven’t tried out Fables, this may just be a great place to start. Blake M. Petit is the author of the superhero comedy novel, Other People’s Heroes, the suspense novel The Beginner and the Christmas-themed eBook A Long November. He’s also the co-host, with whoever the hell is available that week, of the 2 in 1 Showcase Podcast and the weekly audio fiction podcast Blake M. Petit’s Evercast. E-mail him at BlakeMPetit@gmail.com and visit him on the web at Evertime Realms. Read past columns at the Everything But Imaginary Archive Page, and check out his new experiment in serial fiction at Tales of the Curtain. Avengers Academy #1: Marvel relaunched their Avengers franchise with a new first issue… heh, just kidding. That’s FOUR new first issues. Actually, six if you want to include miniseries. But I digress. I decided to sample each of the new ongoings to see which, if any, I would want to continue reading. Not surprisingly, the one I enjoyed the most was the one written by my favorite writer in the group: Avengers Academy by Christos Gage. 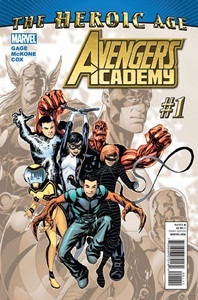 With the Initiative camp shut down, a group of Avengers is given the job of training superpowered teens that were recruited under Norman Osborne’s regime. In the first issue we’re introduced to our core group of six young would-be heroes and the team of Avengers responsible for their training. There’s a lot to like about this issue — the inclusion of Speedball among the trainers not the least of those things. I absolutely despised it when he became “Penance” after Civil War, and bringing him back into the fold this way is keeping true to who the character really is without just ignoring that part of his continuity. The six new characters are well-shaped, well-developed, and each with their own distinct personality. Gage also finishes off the book with a pretty stunning revelation about our young cast. It’s a nice surprise, one that reminds me of the classic reveal at the end of Thunderbolts #1. (It’s not the same reveal, that wasn’t a spoiler, it just gave me the same sort of jolt.) This title has a wealth of potential, and I can’t wait to see what Gage does with it. 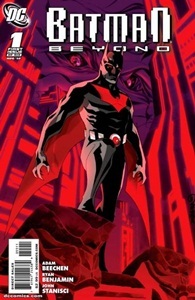 Batman Beyond #1: Ever since the Batman Beyond TV show went off the air, fans of the character have been waiting to see him get some love in the DC Universe. A couple of years ago, we did get a glimpse of one of DC’s 52 Earths where he seemed to exist. Finally, after a tease in Superman/Batman Annual #4, Terry McGinnis is back in his own miniseries. If you didn’t watch the show back in the day, the premise is simple. We’re in the Gotham City of the future, a “Neo-Gotham,” where Bruce Wayne has gotten too old to continue the fight as Batman. Terry is the heir to the throne, a young man Bruce is training as he once trained his Robins, only this young man has taken on the mantle of the bat. In this first issue, someone has murdered one of Bruce’s old enemies, and as Terry races to save another, it turns out the perpetrator may be someone no one would ever have suspected. The last-page cliffhanger here is fantastic. Adam Beechen has plucked Batman’s most potentially dangerous adversary (even more than the Joker) and put him front and center here. It’s also nice to see a nod to the TV show, with Micron of the new Justice League again trying to get Terry to join up. I hope to see more of those characters as the series continues. Ryan Benjamin‘s style is interesting. It’s not a dark, gritty sci-fi comic, but it doesn’t have the animated feel that the original series did either. It exists somewhere in an in-between place that helps to ease the story into the DC Universe. Great first issue. I can’t wait for the rest of this arc. Sea Bear and Grizzly Shark #1: Sometimes it’s worth it to just do something silly. Artists Ryan Ottley and Jason Howard, best known for their collaborations with writer Robert Kirkman on Invincible and The Astounding Wolf-Man (respectively), were at a convention last year, throwing around some crazy ideas. 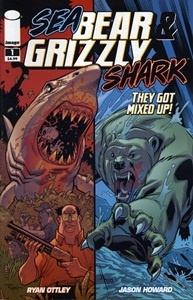 One of those ideas, the idea of a bear and a shark getting “mixed up,” somehow stuck and turned into this one-shot. In Howard’s Sea Bear story, we watch as a young man undergoes terrible personal sacrifice to destroy the ferocious sea beast that killed his family. Grizzly Shark, on the other hand, follow a group of hunters that delve deep into the forest to try to hunt down the ferocious killer. Both stories are bizarre, crazy, and bloody as hell. They’re also a lot of fun. The stories themselves are somewhat ridiculous, and the one-page origin tale written by Kirkman to explain just how “they got mixed up” is even sillier. But it’s an awful lot of fun. The giant-sized book gives you two complete, full-length comic book stories for your money, and you’d be hard-pressed to find two crazier, more enjoyable stories on the shelves of recent comic books. 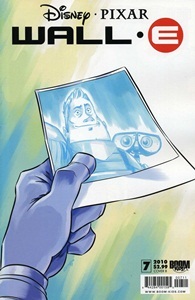 Wall-E #7: This issue wraps up the “Out There” story arc, in which an astronaut named Andy (a nice little nod to Toy Story, I imagine) has returned to Earth to find it empty of human life, including his wife and children. With Wall-E’s help, Andy has been trying to repair his spacecraft, and he just may be on the verge of doing it. This was kind of a low-key ending to this arc… kind of quiet, even a little anticlimactic, but it actually sort of fits in with Wall-E and the desolate world he inhabited before the events of the movie. It’s a bittersweet story, and a highly appropriate one for this title. Bryce Carlson and Morgan Luthi have done a good job with this arc. Carlson’s story is sad, but hopeful, while Luthi’s artwork is a little grimy and dirty, which is absolutely perfect for a story set on the BNL-ruined world that we met in the motion picture. Whether or not the next arc (or any future arcs) will be set after the movie, I don’t know, but I hope they get to that part of the timeline sooner or later. I think there’s a lot of potential there for different kinds of stories than we’ve gotten in this comic so far. 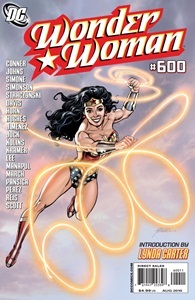 Wonder Woman #600: The 600th issue of Wonder Woman’s title (if you add up the three volumes) arrives with a bang. Outgoing writer Gail Simone and legendary Wonder Woman artist George Perez start off with a tale about an invasion force that only has the power to control men. Diana’s solution? Round up a team of DC’s greatest female fighters to take them out. This story really does the job of showing the position that Diana holds in the DC Universe — who she is and what she means to the other female heroes. There’s also a much more personal half to the story, where we catch up on a forgotten member of Wonder Woman’s supporting cast, someone who first showed up in George Perez’s legendary run on the title. In the second story, Amanda Conner writes and draws a team-up between Diana and Power Girl (with a little Batgirl thrown in). It’s a nice “girl’s night” story that’s very cute, but actually seems to fit in more as a chapter of the Power Girl title Conner recently left than a Wonder Woman story. Louise Simonson and Eduardo Pansica give us a Wonder Woman/Superman team-up, which isn’t bad, but is fairly generic. The last two parts of the issue get more into the real meat. Geoff Johns and Scott Kolins (doing some work that’s very different than his usual style, but in a good way) provide a story that delves a bit into who Wonder Woman is and how people don’t realize her importance. This serves as a sort of prologue to the last part of the story, the beginning of writer J. Michael Straczynski and artist Don Kramer‘s Odyssey storyline, in which Wonder Woman finds herself in an alternate reality where Paradise Island is in ruins and she never became the warrior we know her to be. This is also the story that introduces Wonder Woman’s much-publicized new Costume. I actually rather like the new look (although, like many others have said, I don’t care for the leather jacket), but I also recognize that it’s most likely a temporary change. Even if it doesn’t go back when Wonder Woman inevitably succeeds in restoring the original timeline, she’ll go back to the classic costume sooner or later. It’s an interesting starting point for a story, and I sincerely hope it does the job it promises to do — show people why Wonder Woman is so important, not just to the DC Universe, but to the culture of comic books in general. She’s been severely undervalued as a character for years. I don’t know if Straczynski is the man to change that, but I’m willing to give him a chance. In addition to the stories, the book has an introduction by TV’s Wonder Woman, Lynda Carter, a cover by Perez, and an avalanche of pin-up pages by the likes of Adam Hughes, Nicola Scott, Ivan Reis, Greg Horn, Francis Manpul and many more. Some of these are just okay, but many of them are great. It’s a solid issue, and a fitting anniversary for comics’ first female. Everything But Imaginary #355: Who’s Your Hero? Inspired by a work from the great Mark Evanier, this week I’m taking a look at some of the most iconic renditions of our most iconic superheroes. When I say “Superman,” which image comes to mind? Batman? Spider-Man? This week I look at ten heroes and the artists that define them to me. There are a lot of comics I’ve read once, then brushed aside. But how often does the first issue reflect the author’s best work? And how often is it worthwhile to come back and take a second look? Plus, this column’s Favorite of the Week: Final Crisis: Legion of Three Worlds #3! So, if you haven’t figured it out by now, Geoff Johns is pretty much a bottomless pit of awesome. Let’s run through some of the comics he’s done: JSA/Justice Society of America. The Flash: Iron Heights and about forty incredible issues of that title. Action Comics (the Last Son, Superman and the Legion of Super-Heroes and most recent Brainiac story arcs). Teen Titans. Infinite Crisis. And, of course, the new gold standard for how to do great comics, Green Lantern: The Sinestro Corps War. And just a couple of weeks ago, he hit us with the first of two tie-in books to DC’s current big event with Final Crisis: Rogue’s Revenge. But by damn, this is the book I’ve been waiting for. Johns and the legendary artist George Perez have begun their tale with Mordru, the time-trapper, a longtime foe of the Legion. Mordru, the architect of the Legion’s troubles for years, decides the time has come to destroy the Legion and Superman’s legacy once and for all, so he summons Superboy-Prime from the timestream. The boy who wants to be Superman in the worst way (and I do mean the worst) goes on a tear, breaking open the seams of the prison planet Takron-Galtos. Prime has rounded up every enemy the Legion has ever faced, just as they face the greatest personal tragedy of their storied career. Of course, it’s Brainiac 5 who realizes the only possible course of action. They need help. They need Superman. and since the threat they face comes from another universe, it’s time for them to fight fire with fire… they need the Legions of two other universes to join the fight. It is not an exaggeration to say the first issue of this five-issue storyline gave me chills. Johns has displayed a love and respect for not just the original Legion, but for all three, that I’ve never seen before. I’m not surprised, though — this is the man who found a way to make Hal Jordan Green Lantern again without tarnishing Kyle Rayner, and who is about to be handed the reigns of both Barry Allen and Wally West in the Flash: Rebirth miniseries. Johns respects not only the originators of a superhero legacy, but all of the heroes who have carried the torch. 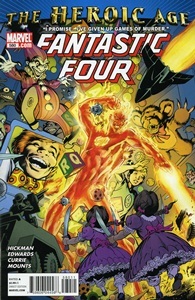 Although the other two Legions only appear briefly, on Brainy’s computers, between those two pages and the rest of the book, George Perez may be a good 75 percent finished with his goal of drawing every Legionnaire of all time in this comic. Johns has created a story that’s not only epic in scope, but also intensely personal for all the heroes involved. They’ve lost someone close to them, and Superman feels a responsibility for what Superboy-Prime has become. Meanwhile, people who have been anticipating this story for a while know that — although it doesn’t make an appearance in this issue — Brainy has a lightning rod with a face in it waiting somewhere… waiting to help a seemingly lost hero make his triumphant return. Then there’s George Perez. Ever since the original Crisis on Infinite Earths, people have known that if you wanna have a buttload of characters in a comic book, Perez is the man to draw it. Not only does he fill this book with Legionnaires, the little details he drops in everywhere are amazing. In an early scene where Prime wanders (and trashes) the Superman Museum of the 31st Century, Perez packs in so many tidbits and Easter Eggs that I could write a whole article just pointing each one out and where it came from. Even the labels — written in the Legion’s language of “Interlac” — are worth looking at. In a scene with statues of Superman over the years, the plaques underneath each one, in Interlac, reads with the name of the classic Superman artist that drew that particular interpretation (Shuster, Boring, Swan, Garcia-Lopez, and Perez himself). And no, I don’t have the free time to sit around translating Interlac — I just have the overwhelming need to absorb each and every nugget of goodness this comic has to offer. Simply put, this is a fan-freaking-tastic opening for this series. Just as Sinestro Corps ran away from the pack and became my favorite comic book story of last year, I’ve got a feeling that this book — coupled with the Superman and the Legion arc from Action Comics — will soon take that trophy for 2008. It just doesn’t get better than this.